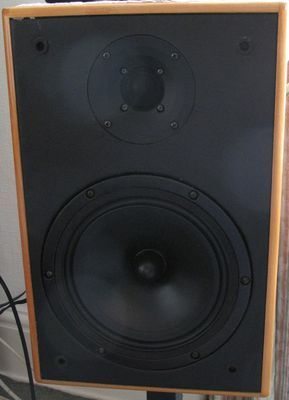 Many years ago my father built a pair of loudspeakers following a kit (the DB6) that was detailed in an old issue of what was either Hifi News or Hifi World. These were based on a custom 8" poly cone woofer and an MDT30, 1" soft dome tweeter, from Morel. The speakers always sounded okay but had a rolled off treble and fell victim of a wide-narrow-wide dispersion profile, as is usually the case, when crossing over such a large woofer to a tweeter. At one point I redesigned the crossover for them, lowering the crossover point and removing the top end roll off that had been part of the original design. This brought about a decent improvement in sound quality, especially in the high frequencies but it never fully corrected for the dispersion profile. The crossover redesign had been done actively in DSP as I had migrated the system over to fully active. This was useful as it meant the crossover could easily be modified to work with any change in driver and as the weak part of the system was really the tweeter I thought it best that these should be replaced and it just so happened that I had a pair of SEAS natty little DXT tweeters sitting on a shelf and without a home. Now of course I have a pair of MDT30s sitting on a shelf without a home, but I digress. Having seen Mark Ks design, using the DXT down to 1500Hz, with a 2nd order acoustic slope, I figured the tweeter should be able to cope with a 1200Hz 4th order acoustic. Even more so since the system is never played particularly loud. I had measured the distortion profile of the tweeter myself a couple of years before and knew it was capable, but this would be pushing it towards its absolute limits. One does not make tasty ovarian treats without breaking a few calcium based casings so out came the router. Unfortunately the cutout required for the MDT30s and the DXT were quite different. Most tweeters these days use a 104mm diameter cutout, Morel had chosen something smaller, which meant new holes needed to be routed for the DXT where the old holes used to be. This is bit of a pain and required a new pivot point to be glued in from behind from which the circle jig of the router could fit into. Yes this was going to be a one way trip but I was confident the new tweeter would prove a success. I had measured the DB6 bass driver before so it wasn't an unknown qunatity but it measures pretty much like you'd expect a decent poly cone too. Smooth. Nothing obnoxious to speak of with a surprisingly clean HD profile. Nothing unusual here, an extremely smooth frequency response thoughout the drivers intended usable range with a mild peak in its response at 10kHz. A dip centred around 450Hz isn't unusual either, especially in a driver of this size and is probably related to a cone edge/surround resonance often found in soft cone drivers. The distortion profile confirms the presence of the cone edge/surround resonance with slight peaking, mostly in the second harmonic at the given frequency. Otherwise the HD plot is nice and clean. Not the lowest level of 3rd order around but the response does show that some linearising techniques must have been employed as the 3rd harmonic remains flat and extended rather than showing any rise. This is an old driver and it is unclear who actually made it but whoever they are certainly did a decent job. Near field measurements of this driver were performed a while ago, and within the original cabinet, showed a Qtc of around 0.8 and an f3 of around 60Hz. Considering the size of the cabinet this is a fairly decent result. Often a higher Qtc is chosen as a matter of compromise in return for a smaller cabinet volume. The often cited 'optimum' value of 0.5 usually requires a significantly larger box than any standmount design would allow for unless it is of particular design. In that case its overall extension is likely to be severely compromised and an f3, in this case, of 60Hz, with a shallow, sealed design, roll-off, gives a very pleasing amount of bass in room. Even so as a DSP is being used with this design that compromise doesn't need to be adhered to. Another one, however, can be. I am no stranger to using Linkwitz Transforms but to be used appropriately both the driver and amplifier capabilities need to be respected. In general terms, unless you are dealing with subwoofers and huge amplifiers, it is best to be gentle with the amount of EQ that is applied. With alignments above the maximally flat Qtc of 0.707 applying a Linkwitz Transform, to lower the effective Q, actually reduces the requirement of the driver and amplifier. This is only for the region where the drivers response peaks above the maximally flat, but it's worth keeping in mind. Of course going the other way for more extension is where things can get sticky very fast. Given that music was the main use for this system I decided to go with a new target f3 of 40Hz with target Q of 0.5. This only requires a small amount of gain so shouldn't tax either the driver or amplifier with usual music signals. Moving onto the crossover design. I had already decided that a crossover of 1200Hz would be a good idea. Nip the off axis issues of the large 8" in the bud completely but keep the tweeter happy. Adding to what we've already seen here is the tweeters frequency response in cabinet. As can be expected there's a hump in the response due to the loading of the small waveguide. But nothing unexpected, nor difficult to work with. Just for completeness below is the woofers response in LspCAD. As described above 4th order LW slopes were used at a target of 1200Hz. 3dBs of baffle step compensation were used. This amount had been determined by experimentation in the previous design. The speakers are placed in proximity to a large bay window, one of them inside it and one of them close to the wall next to it. Originally I started out with 6dB of BSC and dialed it back a dB at a time until the balance sounded right. Another tick in the pro box for active, especially DSP based. The inverse null is very predictable as phase compensation can be used to perfectly align the drivers. Below is the tweeters transfer function and following that the woofers. If you've been reading up until now you will have noticed that the LTs gain isn't present in the graph above, so here it is below! As previously mentioned the amount of EQ applied is mild, but this does add to the gain required for the bafflestep compensation. That ~4dB by 40Hz is actually a solid 7dB. All in all this design sounds great. Previously it sounded far too forward and to my sensitive ears (hyperacusis) quite piercing. The new design fixes this completely, which is good, because it was the main reason for the modification to start with. The improvements didn't fall on deaf ears however as my mother and father also appreciated the upgrade!